This time of year we rejoice in the sunshine and rain (anything but snow!) of the early summer. The grass is growing, the flowers are blooming and seasonal allergies are making noses run, eyes itch and throats scratch. Understanding how seasonal allergies work is important for knowing how to best care for yourself during this season. Imagine a grain of pollen, which looks like a spiny sea urchin, entering your nasal cavity. This pollen will stick to the soft mucus membranes lining your nasal and bronchial cavities. These pollen grains cause a reaction in the body which releases histamine, giving your body the message that an intruder cell is present and triggers the nose to run, the eyes to water and the lungs to cough in an attempt to rid the body of that intruder. These little grains of pollen can make you pretty miserable even though your amazing body is only reacting to protect itself. 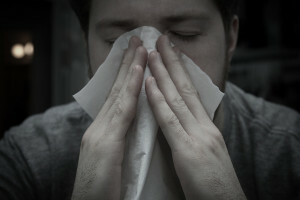 How can you battle seasonal allergies without turning to medication? Here are a few tips for the 36 million Americans suffering this season. Now that we understand that seasonal allergies are being caused by the pollen finding its way into our nasal cavities, it makes sense that washing out the pollen with a saline solution would create fewer allergic responses. The neti-pot has been used in India for thousands of years as a way to keep the airway clean and clear. There are many styles on the market now, but remember to use distilled water and to follow directions. It has often been said that eating local honey can help with allergies since honey contains some of the pollen spores from local flower and grasses; the same pollen that’s making you sneeze. By introducing a small amount of the local pollen into your body through honey your body gets a chance to build up an immune response to the pollen. Additionally, a study from Germany found that incorporating food high in Omega-3, like cold-water fish, walnuts and flaxseed oil, as well as grass-fed meat and eggs decreased the body’s inflammation and therefore reduced seasonal allergy response. For more short-term relief, try horseradish, chili peppers or hot mustard as an addition to your next meal. The spice works as a temporary decongestant and is a delicious, natural remedy. Probiotics are the good bacteria in your stomach and a healthy balance in your stomach and intestinal track boosts the body’s immune system. Several studies have shown that a probiotic supplement decreases seasonal allergy symptoms. A healthy immune system gives your body the power to fight off allergens on its own! Although chiropractic is not a direct treatment for allergies, allergy sufferers have found relief through the incorporation of chiropractic into their lives. By removing interference in the nervous system through the correction of subluxations chiropractic boosts the body’s immune system and gives your body the opportunity to deal with the allergens on its own. Many things control you immune system including your spleen, bone marrow, and adrenal gland. What controls these? Your brain and nervous system! The goal of chiropractic is to make sure your brain and body are communicating at 100%. Give your body a break and try out a few of these ideas for taming this season’s allergies! For more information on chiropractic please visit us at www.awcchiropractic.com. This entry was posted in articles and tagged Allergies, Chiropractic, Healthy, Natural, Probiotics, Remedy, Subluxation. Bookmark the permalink.